Aesthetically pleasing to the eye, quality hard to find at this price point. Sink is heavy and made well, faucet looks great, on the lighter side "weight" in the hand, once installed it's moot. Clear easy instructions, packaged very well by manufacturer, and shipper. Would highly recommend to friends and family. Create a bathroom with timeless style with the Kraus vessel sink and faucet set. The glass sink has a smooth interior that's easy to keep clean and pairs beautifully with the simple transitional design of the Riviera vessel faucet for an instantly elegant look. Love. Love. Love this beautiful glass sink. Whats not to like. The sink is such a lovely addition to our new bath. 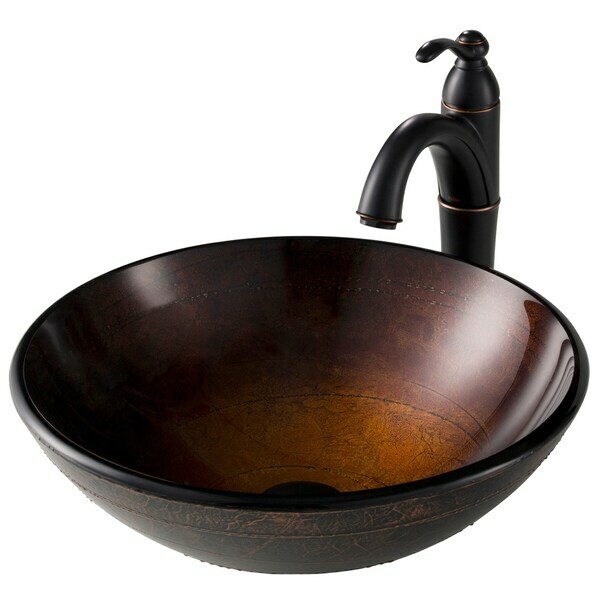 The faucet is a wonderful dark oil rubbed bronze finish. The sink has a rustic dark copper finish. My husband was able to install both in about an hour. This is the second glass sink that we purchased for our home makeover. Both sinks are delightful. The price was unbelieveable. We recently had to replace the cartridge in the first faucet we purchased back in 2009. We contacted Kraus directly and they sent out a new cartridge and O rings free of charge. Customer service has been great. You will not regret purchasing these glasse sinks. Everyone that sees them can't beliveve the price. This sink and faucet were beautiful. Very thick glass and very durable. The faucet and sink were easy to install and came with everything needed. We ordered this for our basement bathroom and what a good choice it has been. The sink is clearly of good quality, is absolutely beautiful, especially as we set it on a piece of granite which is very similar in color. The faucet matches perfectly. And all at a great price. Thanks Overstock. I purchased these in 2013 and still love them. The glass and faucet are easy to clean water spots off, which I really like. This sink and faucet combo are breathtaking! What can I say? Beautiful product. The illusion glass in the bowl + the exterior and faucet make this a standout. I ordered two sinks and two faucets. they are both exactly what I wanted. faucets have a good weight and a sturdy feel to them. The sinks are beautiful they look like metal but they are glass. Love, love, love it. Ordered this for a half bath and I absolutely love it. Great quality and very appealing to the eye. Shipped very quickly and was packed very well. I highly recommend if you are in the market for a sink faucet combination. Shipping was fast. Well packed . Just received today and have not had time to install yet. But I can say I am very happy with the feel &amp; looks of this awesome combo. If it works as good as it looks- 5 stars. I got two of these for my master bath remodel and they are absolutely gorgeous! The faucet compliments them perfectly. "Does this sink and faucet include a pop up drain matching the faucet?" Yes it does, black on top with copper hints so it matches well. Wouldn't have really noticed it standing out unless you had asked so I took another look. This is a beautiful piece that we set in an old wooden dry sink and my wife loves it, very true to the picture and somewhat like glass art. If the color scheme matches I wouldn't hesitate to purchase. I hope this helps. Styling and reviews accompanied by the price.